Most Holy Trinity: Our Father in Heaven who chose Mary as the fairest of your daughters; Holy Spirit, who chose Mary as your spouse; God the Son, who chose Mary as your Mother; in union with Mary, we adore your majesty and acknowledge your supreme eternal dominion and authority. Most Holy Trinity, we put the United States of America into the hands of Mary Immaculate in order that she may present the country to you. Through her we wish to thank you for the great resources of this land and for the freedom which has been its heritage. 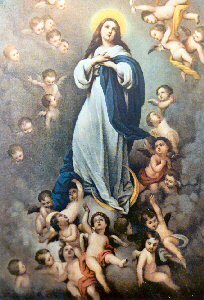 Through the intercession of Mary, have mercy on the Catholic Church in America. Grant us peace. Have mercy on our President and on all the officers of our government. Grant us a fruitful economy born of justice and charity. Have mercy on capital and industry and labor. Protect the family life of the nation. Guard the innocence of our children. Grant the precious gift of many religious vocations. Through the intercession of our Mother, have mercy on the sick, the poor, the tempted, sinners - on all who are in need.